Just imagine this. You’re headed out on for a trick or treating run with your child. They’ve selected a Superman or Wonder Woman costume, since they want to join the Justice League when they grow up. They walk up to the first house of the night. An adult answers the door, compliments your child on their costume, and then drops one measly piece of peppermint candy into their bag. Not cool! Now, imagine that scenario again with your child carrying this Justice League treat bag. Now, that same adult answers the door. They grab that single peppermint candy and prepare to drop it in the bag… but then they see this tote bag. Aquaman is glaring at them. Wonder Woman is striking a battle pose. The Flash is also there, looking extra heroic. Batman is on the side of it with a stern look that says, “You’d better give up the good treats.” And Superman’s serious look makes them reconsider which candy they REALLY want to give your child. They rethink their treat choice and grab the good stuff from the candy bowl. We’re talking a whole handful of chocolate bars and stuff them all into this Justice League reusable tote! 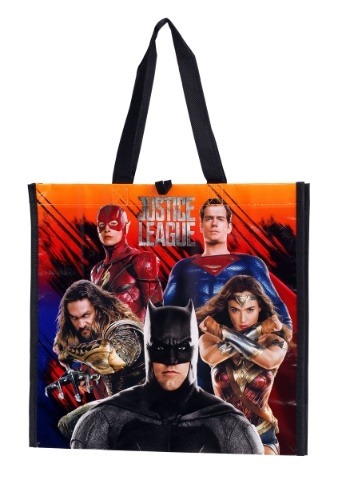 Yes, this Justice League tote bag will help turn your child’s trick or treating venture into a success! Anyone who sees it might just rethink how much candy they give your little one during trick or treat season!